Paper Replika Photo Gallery Updated	. 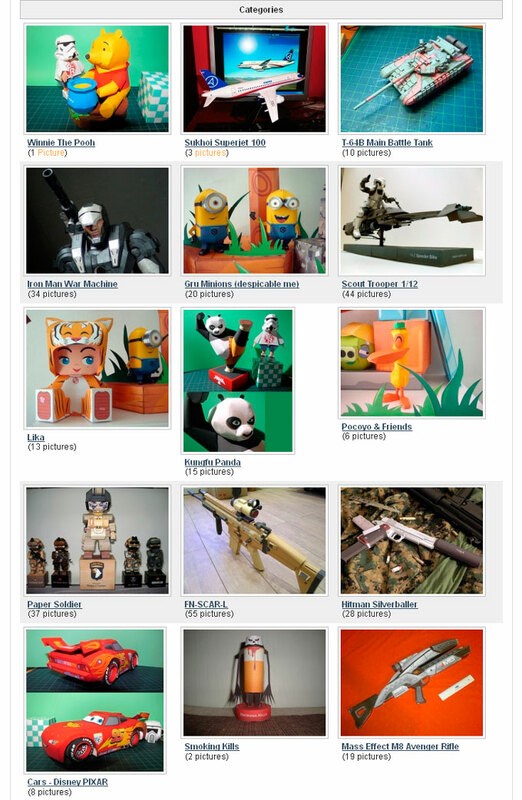 More than 30 photos of built paper models and paper crafts have been added to Paper Replika photo gallery including 3 new categories. These photos were taken from many Paper Replika's friends Facebook photo albums from around the world. They are Pooh bear build by Iro Dorry, he also build Minions, kicking Po (Kung Fu Panda) and Lightning McQueen from Cars. There are also three more friends who build "Despicable Me" Minions , they are Suraj S Prakash, Cường Phan and Ryan Ism who also build Iron Man War Machine, Pato from Pocoyo and Lika (Paper Replika Mascot) . Beside Winnie The Pooh, Sukhoi Superjet 100 is also a new category which filled with photos of paper model by Panji Nugroho. T64B is also a new category with first 10 photos by Vin Jung, he also build Scout Trooper and the speederbike paper model. Baby Po build by Leandro Cabrera. Paper Soldiers build by Renato Macedo ( Densus 88, French Foreign Legion and SEAL team six). Hitman Silverballer build by Kellin Flett and the last in FN-SCAR L build by Nicolas Milet. There are also 2 new videos have been added to Video Gallery.